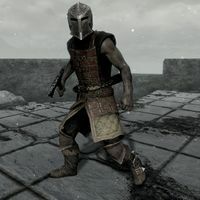 Dawnguard Scouts are bandits of any race that sometimes appear at the fast travel arrival point just outside the Castle Volkihar keep. They arrive in groups of three (one melee and two archers) and will attack immediately if you are allied to the Volkihar vampires and are a vampire lord. However, they don't appear at all if you are a member of the Dawnguard. Dawnguard scouts each carry a war axe and crossbow. They may also have a small amount of gold on them. They wear full Dawnguard armor, although they may sometimes not include the helmet. This page was last modified on 10 October 2014, at 00:29.